In the world of modern technology, students as well as profession is advancing their way of finding information and source for their study. Most students these days prefer going online rather than going to library for information on some particular subject for their study. Hence, in order to do effective internet research, what should students do? The following tips are some advices that would take you to the information you want to find. Be clear about what you are doing is the first priority you need to have. You should have clear and specific topic in mind before you go online. You know what information you want to find, and what purpose you are going to do with it. If you do a research about that, siting is really important. Even though most of students would go Google when finding information, there are always another way around. You can either go to Yahoo or Bing besides Google. On the other hand, YouTube can also be one of the source that provides you good information, but it is not easy for siting later on. Of course, when you go online, you have variety of choice. Only one word can affect the result of your search, so you have to be careful with what you ask the internet. You have to know your keyword of your topic. Be short and precise, and be sure that you do not write a 100-words sentence in there. If you want to find words as a group, you should put quotation mark around the phrase. Normally, you do not find information in a blog and write it in your paper. It does not work like that. You have to look really careful into credible source of information. 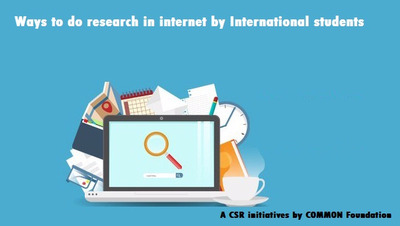 The source you may take from could be a research paper of government, or may be some organization or NGO that are working in the field of your research topic. Try as hard as you can until you find a credible source. Plus, you have to give credit to your source (siting them) when writing in your paper too. It is very important to keep your finding during your research progress. When you find some information or source that you think benefit to you, do not forget to save that link or name of website. You never know when you will need those information again. You can do that by create your own folder in your PC, or save to Drive in order to keep them safe. Till today, there have been 14891 visitors (25026 hits) on this page!